Kandlerova Street together with Sergijevaca Street form a ring around Kaštel Hill and connect the ancient Roman and current focal points, Forum and Arena; together with all the ascents and St. Thomas Square, the site of many cultural and entertainment events over the last 30 years, they become the city’s main artery during the tourist season. In order to define Kandlerova Street and all the ascents along this street as Pula’s Art Zone, the Administrative Department for Culture launched the “Art Zone Kandler” project in 2014 with the aim of turning this area into a center of cultural-artistic creativity. This new Art Zone in Kandlerova Street includes the “City Gallery”, “Stari Grad Gallery”, “Makina Gallery”, “Legović Gallery”, “Poola Gallery”. 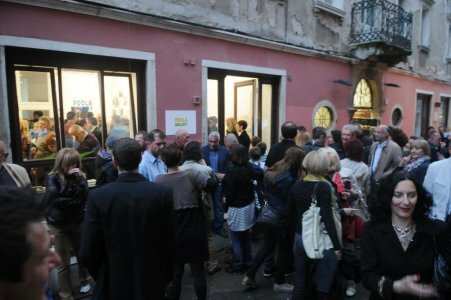 The gallery “Kandler 5” opened in 2013, and centers of literary activities in the Art Zone are the “Homeland bookshop Petit” and the Pula branch of the “Central Croatian Cultural and Publishing Society”. In 2014, “Artstudio Gallery” opened its doors. Cultural programs are held in the Pula Cathedral of the Assumption of the Blessed Virgin Mary, at the Square of St. Thomas, the patron saint of Pula, where concerts, plays and many different cultural events take place as part of the Art Zone Kandler project. During the summer months, stalls are set up behind the bell tower in St. Thomas Square, selling hand-made products.